For many years, I’ve believed that I have the most fun and creative mom in the world. When I read the manuscript for The Original MBA, I realized that Sandy’s mom personified those qualities as well. I was so honored to help Sandy turn her manuscript into a beautiful book that shares her mom with the world, along with important lessons for life and for business. This book began as a gift for Sandy’s late Mom, Eileen Weaver, who was losing her battle with breast cancer. Mother’s Day that year was tough, and Sandy gave Eileen a printed and framed list of the lessons her mom had taught her. Some of those lessons are in the book, complete with the stories of how Sandy first learned them and how they helped her succeed. Hear more about Sandy’s mom and her journey of publishing The Original MBA on this Write Here, Write Now radio interview. The watch a video review of the book by professional speaker Terry Brock. It was wonderful collaborating on this project with Sandy. Anyone working with her can tell she learned from her mom how to channel her creativity and have fun! Find out more about Sandy, hire her to present a workshop or keynote or contract her to turn your audio recordings into products. 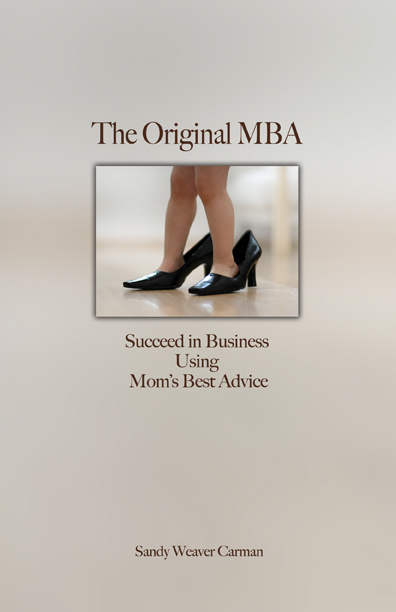 Oh, and buy a copy of The Original MBA for your very own. A percentage of all book sales are donated to breast cancer charities (in honor of Sandy’s mom) and University of Georgia’s Veterinary Teaching Hospital (in honor of her Siberian Husky, Billy). Available on Amazon and Barnes & Noble in paperback, as well as e-reader formats.